I made the Squash, Zucchini, Red Pepper Polenta casserole yesterday and it was pretty simple and quite tasty! While not vegan (just veggie), it didn’t have a huge amount of cheese, egges or butter, and no milk or cream in it. Yarbs came over for lunch and we feasted on it! We ate half of the 9″ circular casserole. Boom came home and wondered what happened to it – I was all, 1/4 in my belly and the other 1/4 in Yarb’s belly! I am surprised that he wouldn’t have figured we ate it all – we are eaters! It was, all in all, a success. I will add it to my repertoire – I wonder if it would freeze ok… may need to give that a shot. Then I could make 3 at the same time and then just freeze 2 of ’em and pull them out when need be. Boom had been a great sport with my whole going veggie, ’cause it basically means he has to go veggie, by default, since I won’t cook meat and I am usually dealing with meals we eat in the house. So I decided to try a recipe that Oprah used during her 21-day cleanse. A tofu wrap – it was delish! And it met all my criteria for a try-worthy recipe – short ingredient list and few steps to make it. I like to dabble in veganism, but not sure I could give up eggs and butter. This wrap is vegan and really, it was so good! Full of flavor and just very fresh tasting. Boom really enjoyed it as well! It says it serves 4 for lunch, but we gobbled all of it up – the 2 of us for our dinner. I think even non-veggies would enjoy this, or I could replace the tofu with a white fish and make spicy fish wraps! So many possibilities! Although we moved down to H-town will just the bare necessities, we are getting by. I am cooking a little, mainly when Boom is around, but also just to eat healthy. Yum! A poor man’s succotash over spinach and French lentils… used organic frozen corn and edaname, and just tore up some spinach (the heat from the lentils and succotash wilts the spinach), and put it all over French lentils. Has been my lunch for the past 2 days! A day or so before we left Richmond, we went to the local healthy grocery store, Ellwood Thompsons, and grabbed dinner. I had quinoa topped with their fancier succotash. 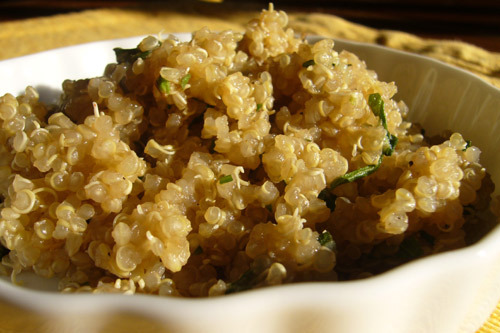 Since then, I have been a little bit obsessed with making it – I have already made it once with quinoa for Boom. I think he liked it, but that it didn’t fill him up all the way. That is the problem these days – since I am not cooking meat, Boom is growing thinner and thinner. I feel kinda bad, but I do think he eats meat at lunch and when we go out to eat, which is fairly often. Today I finished all but a little nub of the cheese. Figured I could save that for Boom tonight – likely should have saved him a little more – opps! I was at Macy’s the other day looking for drinking glasses (we have gotten rid of all our plastic glasses, as they possibly leach bad things when put in the dishwasher) from the Martha Stewart Collection. I didn’t end up buying glasses there (got them from Kmart – their Martha Stewart Everyday line – I heart that line! It is great – tho Kmart is totally ghetto. I guess I am lucky we have Kmarts in Va… don’t think they exist in TX) but I did end up getting a cute glass container (supposidly to be used for snacks, but would be a huge amount of snacks…) with a turquose top and matching towels with a turquoise accent on them for my downstairs bathroom. I think the towels are actually bar towels, but they look cute. I cooked up the rest of Ruby’s pumpkin, as part of her veggie dog diet. This time it was a little odd – as the pumpkin was still the one that Ims and Gretty gave to us, but I had frozen the extra. So I thawed it out, and it was already mushy from defrosting, and then steamed it. Ruby knew exactly want was going on, and was very excited! Here is the cooked pumpkin. I give her a heaping amount of pumpkin with a scant 1/2 cup of dog food on top for each meal. Makes her deuces orange and big, but she does love it! As we are using up our conventional cleaners (and paper products), I am replacing with cleaners that don’t contain toxic chemicals (paper products that are unbleached and recycled) – which is better for us and the earth. I was a little wary of using this Seventh Generation dish washer detergent, as our dishwasher is not the best. Has left food and stuff on the dishes in the past – so I had to go from using the water miser mode, to the full water mode. Anyway, this stuff works great! and I can use the water miser mode again. Seventh Generation promised to get our dishes sparkling clean, and they did! I am quite pleased.